I had a great time bowling in China with awesome friends and teammates. We choose our bowling balls, read the instructions on the wall explaining how to bowl, then started our game. We brought some grapes, waffers, and sunflower seeds as snacks. As we bowled, the computer scoring was a little random. It'd assign free strikes and spares without having to bowl either. Something the machine that reset the pins would knock over a couple as it tried to clean up the pins. This really went against my super competitiveness (but did serve to inflate my score). As we approached the end of the game, we quickly did math in our head to calculate the number of pins needed. In China, certain double scores earn cash vouchers to use next time you bowl. Low scores (55, 77, 88, 99) receive 5 RMB, medium scores (111, 122, 133) receive 8 RMB, medium high scores (155, 177, 188) receive 10 RMB. As the scores increase, the voucher increase all the more. 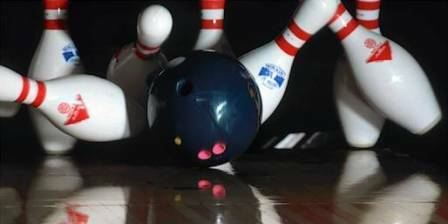 So to receive the vouchers for the good of the team, you're required to throw gutter balls at the end of the game to ensure you finish with a double score. This really went against my competitiveness (or maybe it change me from being competitive for the highest score to being competitive for the highest double score). By the end of the night, we had 32 RMB in vouchers.